This full color resin features an oval swirl of silver and gold shooting stars orbiting a golf club and green giving this piece a sense of motion. Add a personalized plate for your event for a modern, budget friendly award that is out of this world. A black, gold and silver flame serves as a back drop and frames a golfer on this female golf ignite resin. Simply add a personalized plate and this modern award design is ready to go to recognize your players who are burning up the golf course. A black, gold and silver flame serves as a back drop and frames a golfer on this male golf ignite resin. Simply add a personalized plate and this modern award design is ready to go to recognize your players who are burning up the golf course. A silver and gold star backs this adorable, comical character with golf ball head and a winning smile. 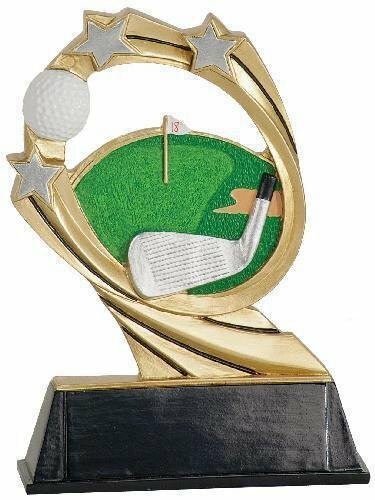 Add a plate personalized for your event to the 5" Little Pals Golf Resin, and this modern, budget friendly award is perfect, especially for the younger athletes, but great for any age.